Sunset picture, and no artificial lighting this time! 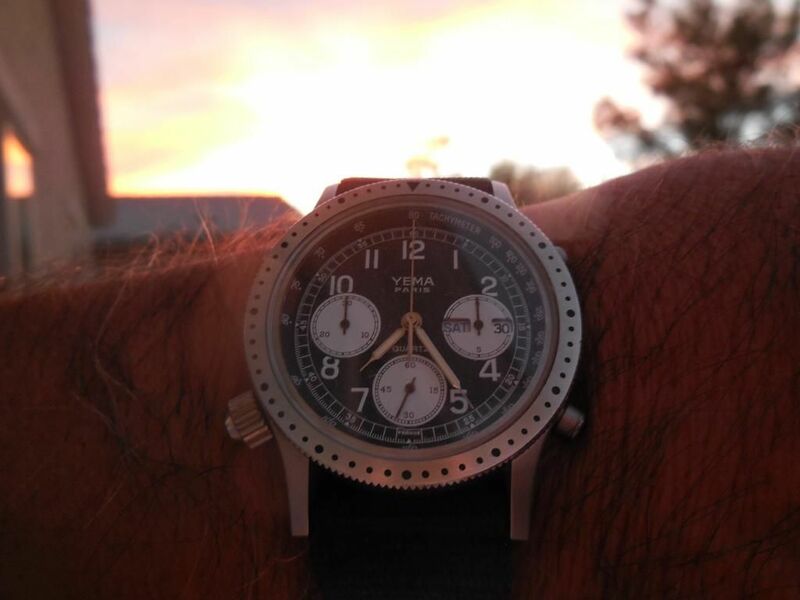 Yema N8 1X2 6 on a one-piece U.S. Military watchband. At least I didn't inadvertently 'turn the page' on you, this time, Paul. 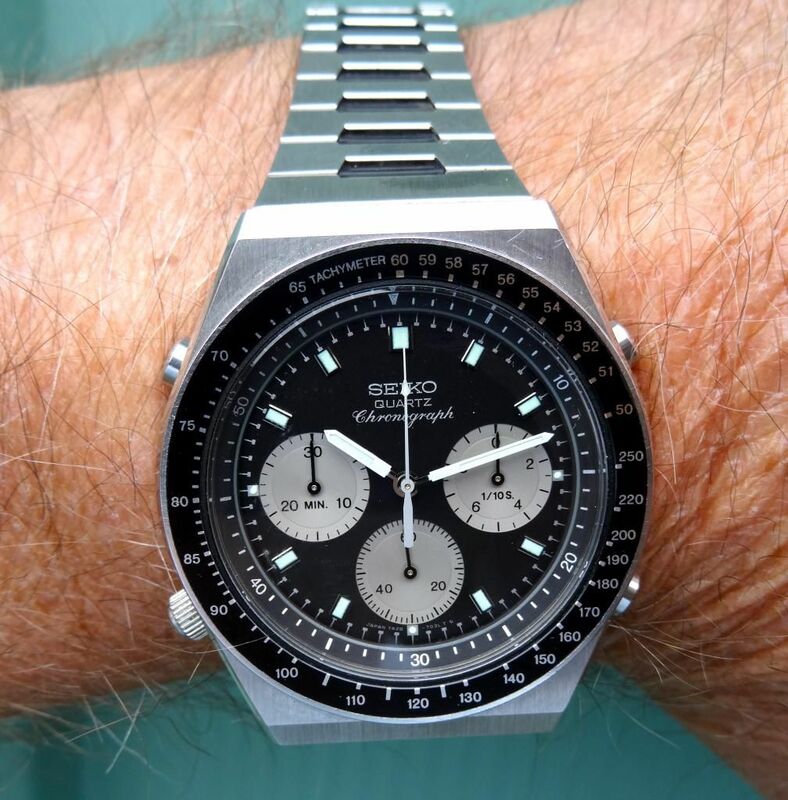 With all the Yema N8's, Orient J39's, other brands and even Frankens posted in this thread recently, a 'newbie' might get the wrong impression - that none of us 'old hands' ever wears a Seiko 7A38. Not so. Here's one of my regular everyday beaters to prove it. Pinch, punch, 1st of the month, and all that. Two shots for the price of one Tuesday - 'cos I couldn't decide which to post. 7A38-7070 SAA031J (early style polished edge hands). I'll be wearing this for the next three days as I head to Berlin, then Amsterdam. 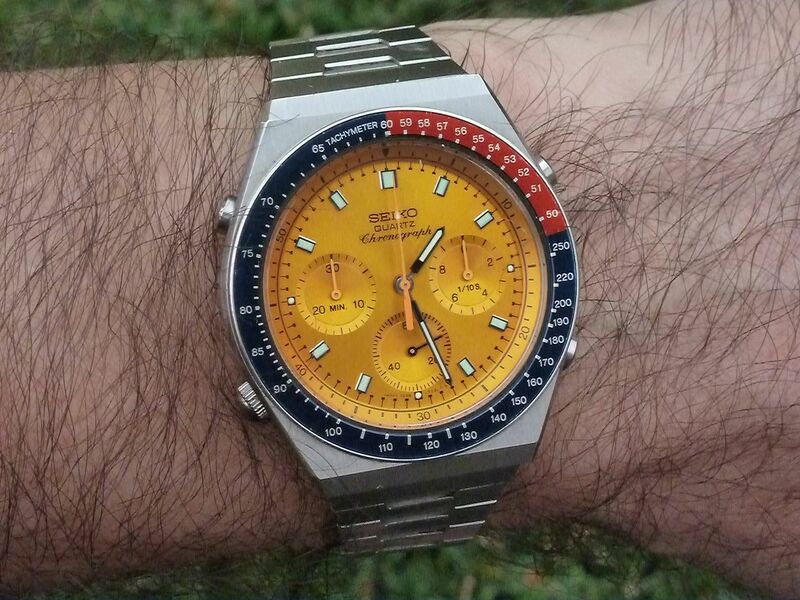 < VERY nice in Yellow > I think this model hangs very well on the wrist. I haven't worn this one in ages. It's not in the best condition, by any stretch of the imagination, but I'm content just to have an example in my collection. 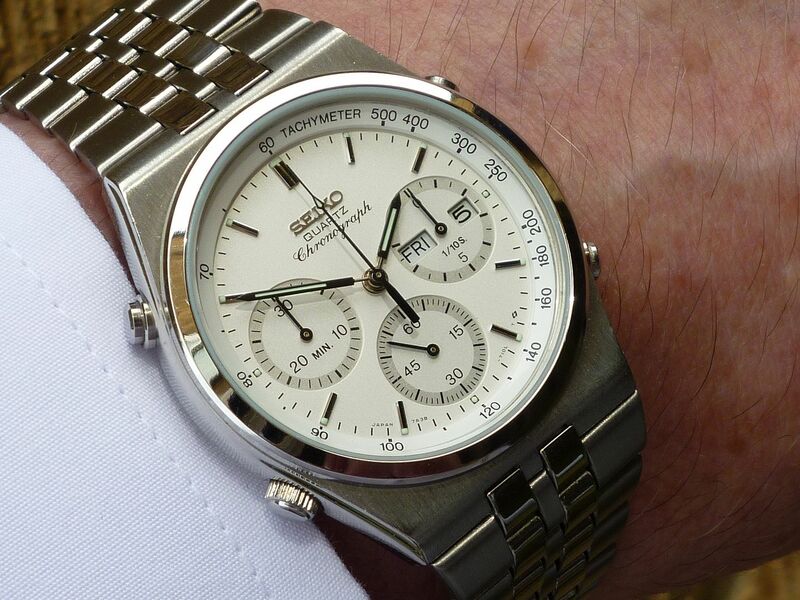 In it's day, the most expensive 7Axx that Seiko ever offered - with a Japanese retail price tag of 100,000 Yen in 1985. 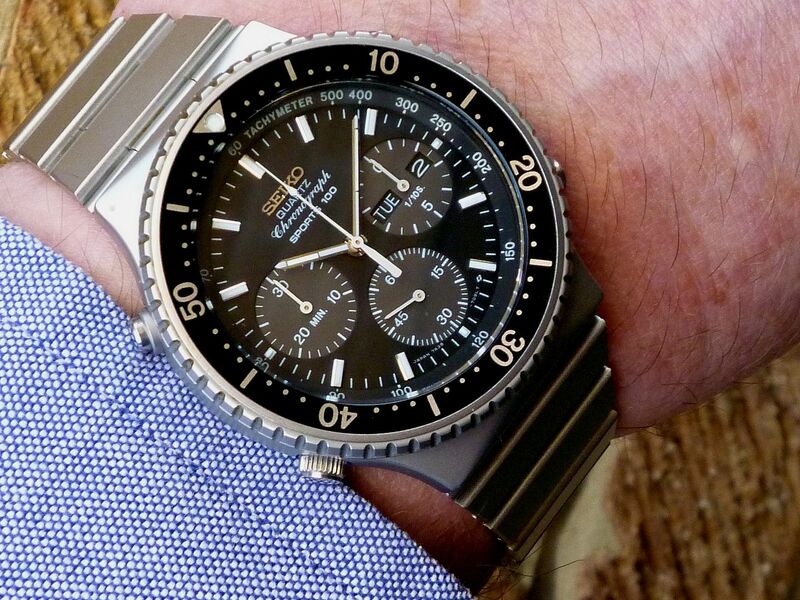 The all-Titanium (including the case-back) 7A38-7030 SJS018. 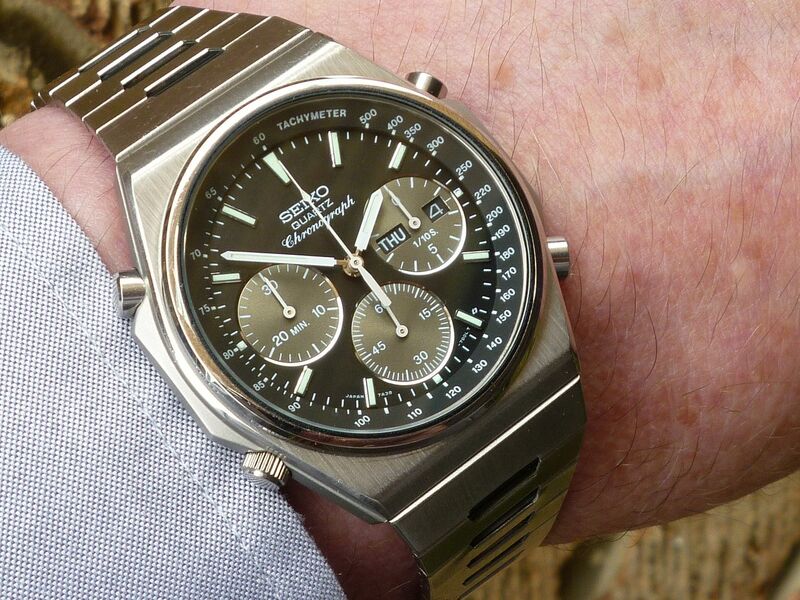 Another favourite 'regular everyday wearer' today - my 'second string' stainless 7A38-7000 SAA007J. Another of my weekday workaday wearers in regular rotation. Stainless 7A38-7280 SAA119J (non-standard Sternkreuz crystal gasket). Something for the weekend, Sir ? 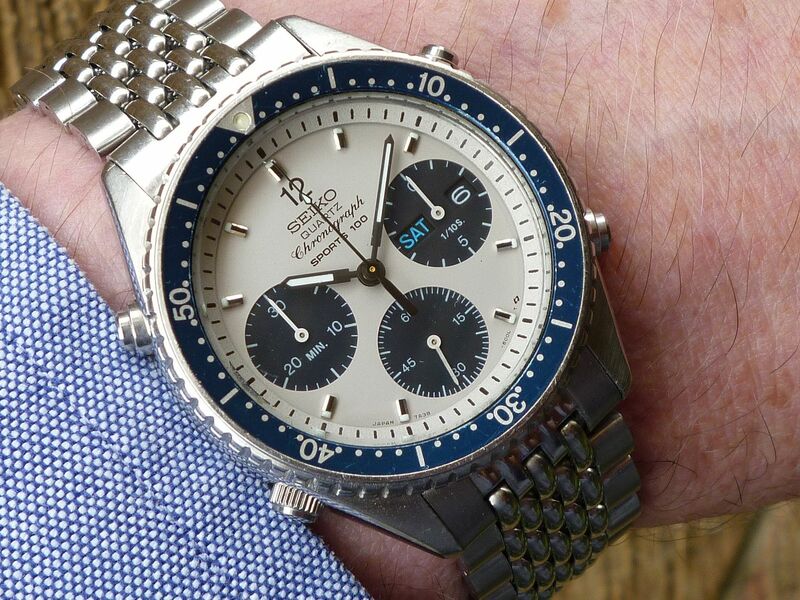 My 'Dinky Diver' 7A38-6000 on non-original late-sixties vintage Seiko 'Beads of Rice' bracelet. 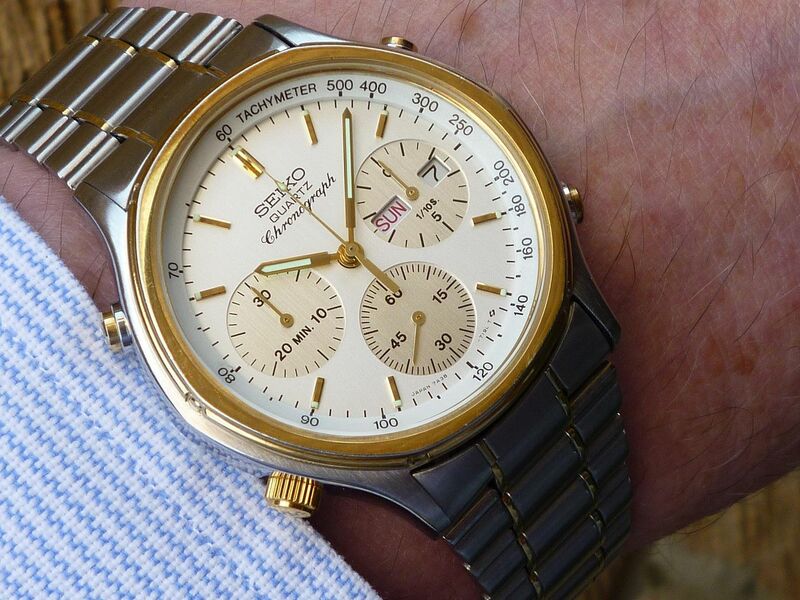 A bit of subtly understated Italian market 80's bling this sunny Sunday morning. My relatively recently acquired 7A38-724A SAA086J. Shades of grey and peppermint green this morning. 7A38-7040 SZLK001. 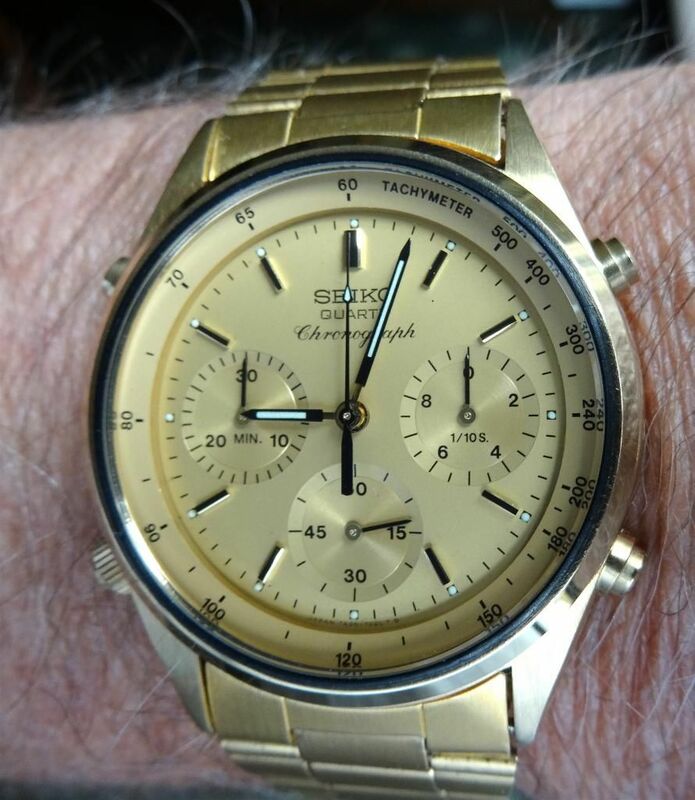 Nice series of 7A's Paul It is a cold foggy morning here in the Calif. North Coast So a BRIGHT--- common 7a28-7029--- sold all over the USA during the 1980's in Sears, JC Penney's etc. (Jan 1988). Cheers, Don. 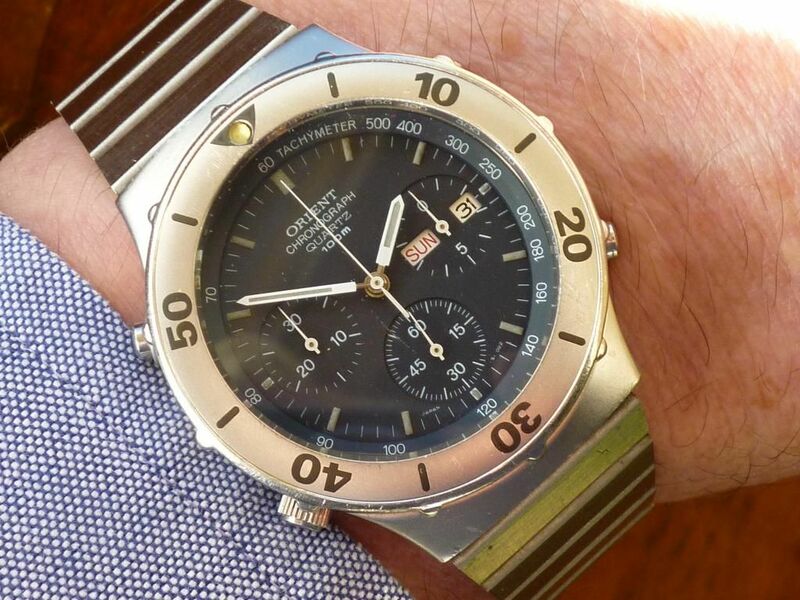 Here's the day / date equivalent of yours - the not so common, but equally blingy 7A38-7060 SAA018J. 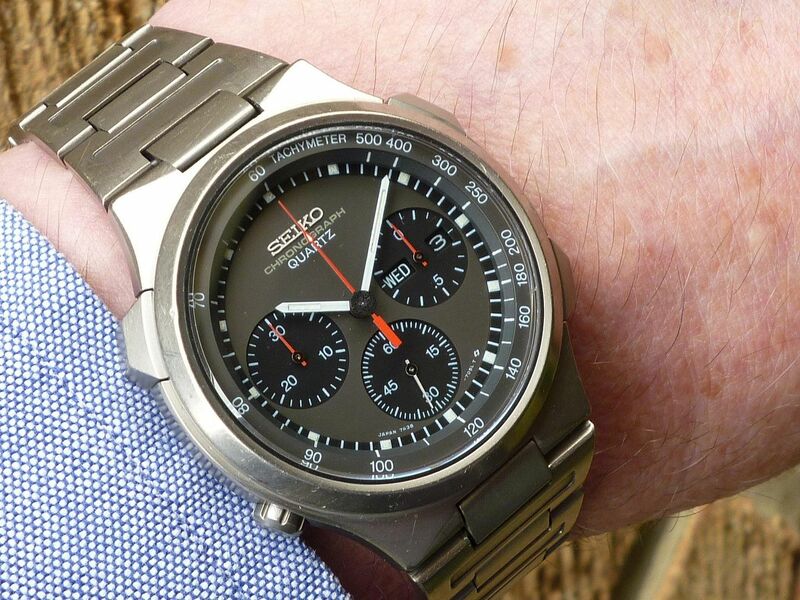 PS - In case you hadn't guessed, I'm trying to go a whole month without posting a single wrist shot of any non-Seiko 7A38. Hey I can now post on here, my first 7A28 - 710A. 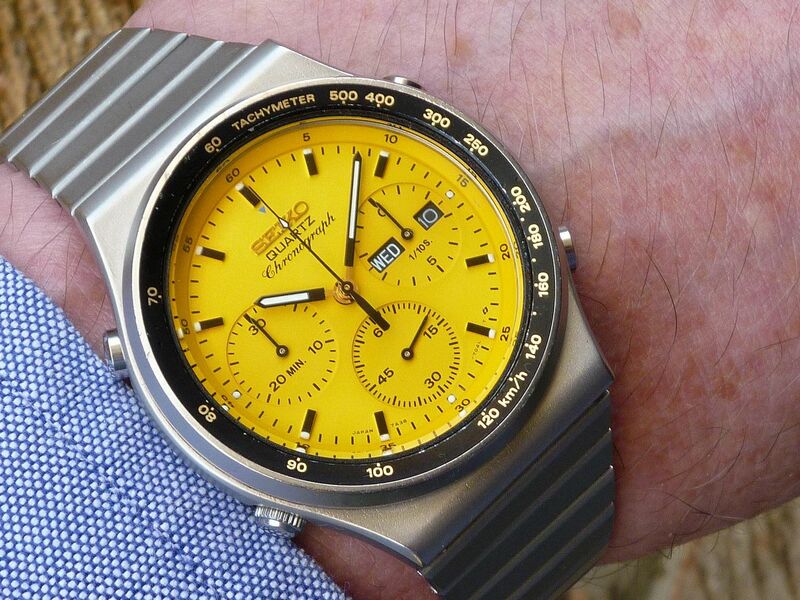 Nice JDM in Mellow Yellow-----My 7A28-7039 in black from March 1983. But I presume by 'Come on Paul put another shot of her big brother up', you were referring to my 7A38-701B 'Vulcan' SAA005J ? Yep, that would be the one. 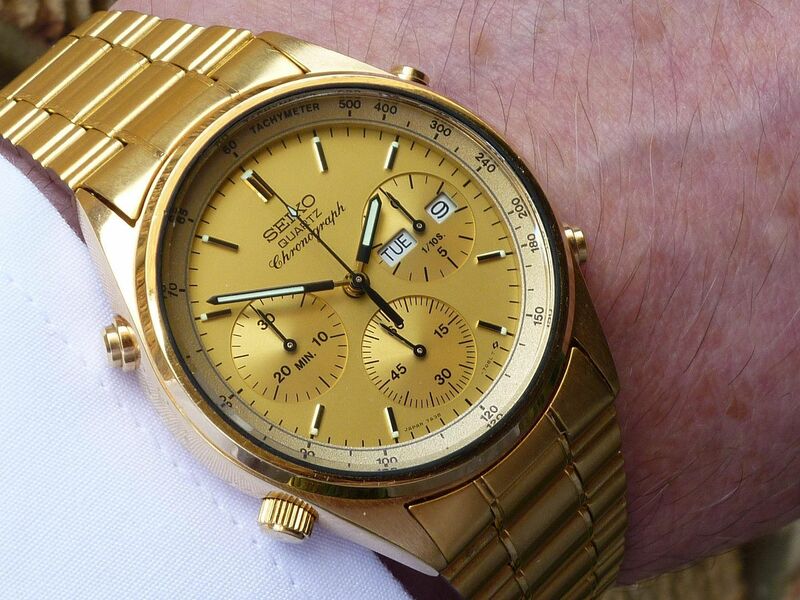 I don't know what it is about yellow faced watches but I love em, the contrast between the yellow and the black maybe. 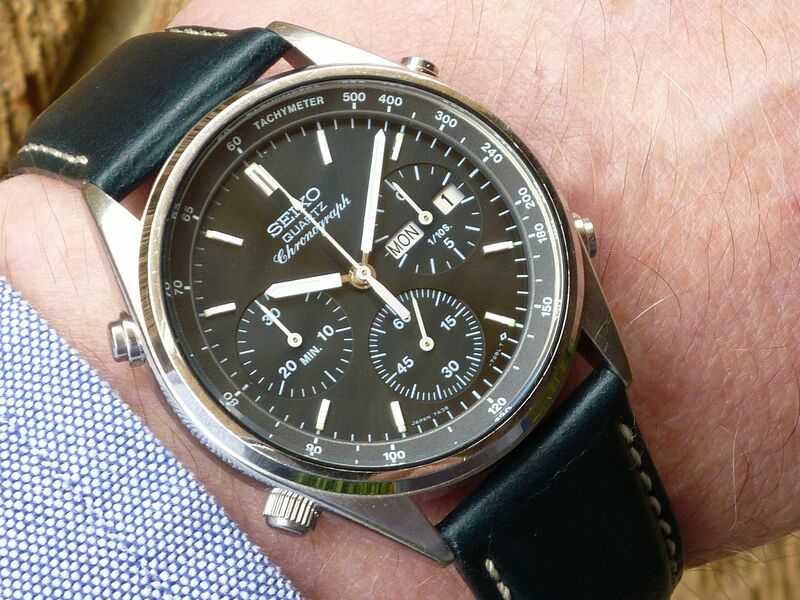 I am thinking that I must have one of these but I am sure I will have to wait a long time before one comes up. 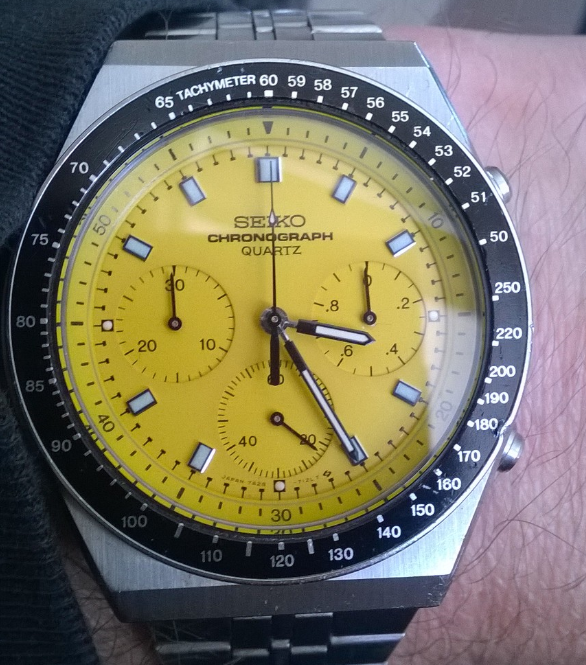 Today it´s my "holy grail", the 7A38-701A (with wrong day/date-setting ...). 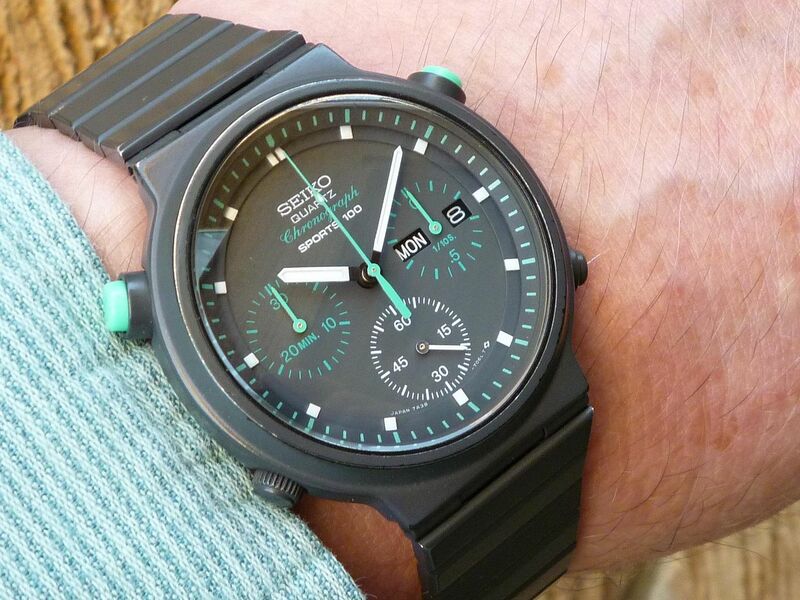 In the meantime it got a new, correct glass and is back with the original, grey bezel inlay. 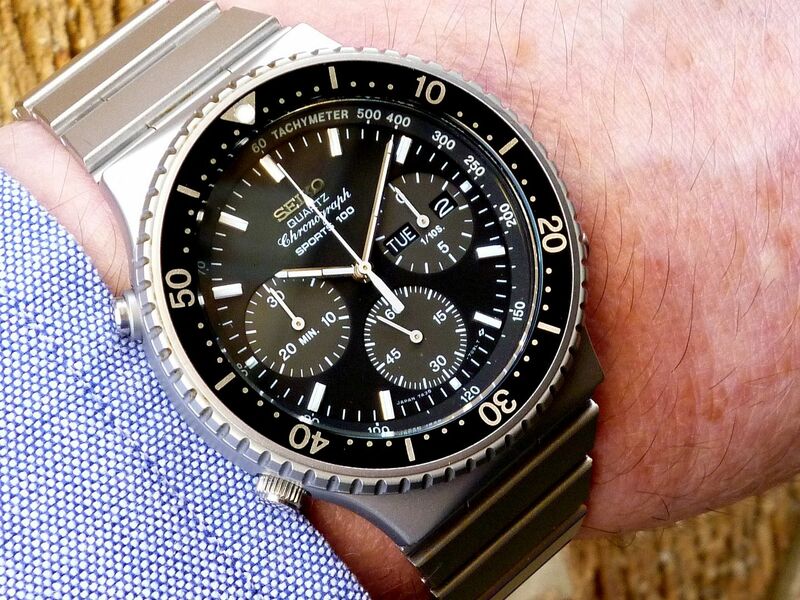 I like the overall look of the watch much better this way.